After last year's successful crowdfunding campaign to bring back The Fantasy Trip, project supporters packed the new Legacy Edition box with so much amazing stuff that we had to make the box larger than first planned. Many of you who missed out on your chance to back the Kickstarter campaign have asked: "When can I get mine?!?!?" Well, we've now got an answer for you: April. Coming in April, the oversized Legacy Edition box includes The Fantasy Trip: Melee and Wizard games, the Death Test boxed adventures, the In the Labyrinth roleplaying rulebook, and much more! So much more, in fact, that we've had to designate a number of components as exclusive to the first printing . . . there's just too much for us to afford to pack into later printings of the game. 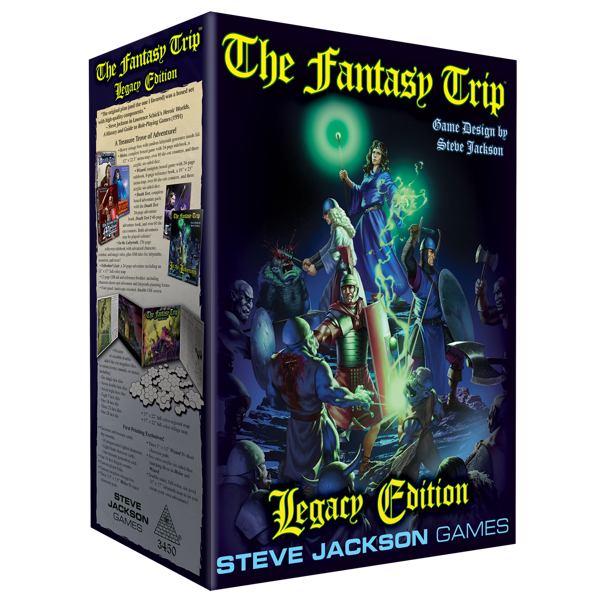 You can learn more about The Fantasy Trip: Legacy Edition at the official webpage, and be sure to follow us on Twitter, Facebook, and Kickstarter for news on the next crowdfunding campaign for new TFT expansons and accessories.